They generally have a great work ethic – on time, don’t call in sick a lot, concentrate on doing their job when they’re there. A strong LinkedIn profile can remove every one of these obstacles. I’m about to tell you how, but first I need to make two points about LinkedIn and social media in general that you MUST take to heart before you even delve into the social networking world. 1.) If you’re worried about your privacy on social media, protect yourself with SOME of the privacy products each site has in place (not publishing your phone number, for instance) and then GET OVER IT. I personally cringe when I see that some people on LinkedIn will not allow anyone to invite them to connect unless that “inviter” knows the “invited”‘s email address. LinkedIn is about expanding your network. If you’re only going to connect with those who already have your email address you might as well leave the site. 2.) Social networking is about marketing yourself through online word of mouth, but if you are blatantly self-serving you will do your cause more harm than good. The rule of thumb for social networking is 90 percent information (helping others) and 10 percent promoting yourself, your product and your business. If you break that rule too flagrantly you’ll be shunned, and you won’t sell anything – yourself, or your firm. I have 1900 in my LinkedIn network and I’m in 52 LinkedIn groups. I often get invitations to connect. But if that person’s first approach to me is to try to get me to buy his book, take a look at her site and see how wonderful his or her product is, or some such, I decline the invitation and report the invitation as spam. The same rule for Twitter. If someone begins her approach to me with a sales pitch I block her profile. Now not only can’t she approach me again, she can’t even see my tweets. So, what good did her sales pitch do her? A LinkedIn profile is free. While it can be helpful to sign up for the first-level paid version (about $25 a month) you can do very well with the no-fee level. The biggest drawback with the free version is that you’re very limited in the number of people to whom you can send private messages at one time. My suggestion is to start with the free product and then if and when you find yourself stymied in what you need to get done for your job search, sign up for the paid level. Recommendations – It allows you to publish recommendations that stay forever on your profile. Your former employers, business colleagues, clients and anyone who can speak to your reliability, wisdom, organization skills, digital savvy, ability to learn, willingness to take on new tasks, and overall workplace accomplishments and work ethic, can come to the site and publish their testimonial to your profile. Resume – You post your work history, education, skills, and certificates of accomplishments. You might NOT want to publish any position that you held prior to 20 years ago, or any that run counter to your current goals. Back to the grocery clerk that wants to be a real estate agent: It’s probably important to show that he worked as a grocery clerk if that’s his only interaction with the public. If however, he was trying to start his own tax preparation service, and sought clients, it might be far better to leave off the grocery clerk job. Remember, this is NOT about giving your resume to a prospective employer, where lying or omitting can come back to haunt you. This is about putting out there only those things that will advance your cause. A gap is not the issue it would be on a job application. And if you want to start your own embroidery firm all you have to do as far as LinkedIn is concerned is to give your new business a name, and add that ownership to your resume. “Owner, Edie’s Embroideries,” becomes part of your profile, after which you’ll be given an opportunity to say a little about your business. Links – Your profile includes links to your blogs, your Twitter profile, and your website. These are proof that you keep up with the latest technology and digital media, AND it drives people to these sites, where you can show them even more about how smart you are, how self-directed, how interested in and knowledgeable about your fields of interest (which hopefully include the industry in which you seek a position.) Even better, especially if the job you seek is in marketing or sales, it shows how many followers you have – how many people you were able to persuade by your words and your choice of topics – to read and follow what you have to say. Of course, good communication skills are important to any job. Your social posts, tweets and response to questions (assuming they’re well written and free of spelling and punctuation error) speak to your top-notch written-communication aptitude. Updates – Directly under your photo and heading there is a field for your latest “Update.” An update is a message that you post on any topic you wish. You can set your LinkedIn profile to bring in your tweets automatically and if you do this is where the latest post or tweet will appear. You can as well just post something else directly there. Others can then like the post, comment on it, share it with others on LinkedIn, and click on “See all activity” to view all your LinkedIn updates. An update is a powerful way to send out the message that you seek a new career, or that you’re smart, capable and well-trained in X industry. Groups – Join every group you possibly can. The limit right now is 52, I believe. Join every group that is specific to your local area for which you might have affiliation, join every group in an industry you know, and every group (that allows you to join) in the industry in which you wish to work. – You might wonder how you get involved in a real estate agent group when you’re not an agent yet. You do that through discussions. Every group member is allowed to post a discussion (though some group owners opt to approve / moderate these before published, most don’t.) But if you’re that grocery store clerk with two houses who hopes to become an agent, you might respond to a discussion about great customer service by saying, “While I’m still in training to become an agent (or ‘while I’m not yet an agent but hope to be one soon”) I do own more than one property, and here’s why I chose the agent I did.” and then talk about the great customer service he or she provided and how you plan on following her example when you get your license soon. – You could as well post a discussion titled “Real estate owner/investor seeks tips on seguing that into successful agent career.” And then your question might be, “A long-time real estate follower and investor, I long to turn my love of the industry into a new real estate career. What do you recommend for study materials, sites and blogs I should follow, and what is my best approach to local brokerages?” Not only will you get recommendations on classes, sites and blogs, you will probably be approached by one or more local brokers about working for them. – One big caution – do NOT jump into discussions when you first join any group. You should lurk for a week or two – see who is there, invite folks to connect, and observe the ongoing discussions. – One of the best benefits of being in a group is that if you don’t know the person, and you don’t know anyone on LinkedIn that’s in his or her network to connect you with him, you have the right to invite him to connect with you because you’re in a group together. 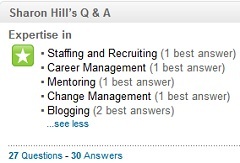 Questions & Answers – LinkedIn enables members to post questions, which are organized by category, and to answer the questions of others. The person who places the question rates the answers, assigning a best answer to one. That “best answer” contributor is then assigned expert status for that category, and that status becomes part of his or her profile. My response to various questions over the years have earned me expert status in Staffing & Recruiting, Career Management, Mentoring, Change Management, and Blogging. And I am self taught in every one of these categories! Before you publish your LinkedIn profile – or very shortly after – you MUST create a Twitter profile. Don’t scoff – Twitter might seem silly to the uninitiated but it’s powerful, and easy. It takes time, as does all social networking. But Twitter is the perfect vehicle for showcasing your interests and your expertise, for branding yourself, for quickly growing an audience for your job hunt and/or your new business, and for bringing that in to your LinkedIn profile on a regular and automated schedule. There’s another reason why Twitter is vital to your LinkedIn profile. Remember that recruiter objection that your age might make you more vulnerable to illness? Well, Twitter is a great way to showcase your hiking experience, your love for your regular gym workouts, your participation in the local tennis tournament, for example. You could even Tweet that your doctor gave you a clean bill of health. There is no limit on how many Twitter profiles you can have either. You might set up a second one in which you call yourself “JimattheGym” or “CourtKatie” or some such, and tweet about your own experience, about the latest events at Forest Hills, or the best elliptical product for home gyms. You could allow your business-related Twitter profile to post to your updates but manually intersperse that with the sports profile once in awhile. Additionally, you are allowed to include multiple Twitter profiles as links in your LinkedIn profile. We’ll talk about Twitter in depth in a subsequent post. If you get stuck or have additional questions feel free to contact me. I might not respond immediately if I’m with a client or in a meeting, but if 24 hours pass without my responding, do send another email. Perhaps it got lost in my spam filter. Thanks for listening. Are you on LinkedIn yet? Previous Previous post: Interns Over 40 Free Job Search Webinar Wed – HURRY!